Bishop Joseph Leopold Imesch was born on June 21, 1931 in Grosse Pointe Farms, Michigan, the second son of immigrant Swiss parents, Dionys and Margaret (Margelisch) Imesch. He was baptized at St. Ambrose Church in Grosse Pointe, and later attended the parish elementary school as well as St. Paul Elementary School in Grosse Pointe Farms. He completed his high school and college education at Sacred Heart Seminary in Detroit. He earned a Licentiate of Sacred Theology (STL) while studying in Rome at the North American College (1953 -1957) and completed further studies at the Gregorian University (1969 – 1970). Following his ordination as priest on December 16, 1956 by the Most Rev. Martin J. O’Connor in the Chapel of the North American College, Father Imesch completed his studies in Rome and upon his return home was assigned as assistant pastor at St. Charles Parish in Detroit (1957). He then served as Secretary to John Cardinal Dearden from 1959 to 1971. He was named pastor of Our Lady of Sorrows Parish in Farmington, Michigan in 1971 and served in that capacity until 1977. In 1965, he was named a Papal Chamberlain, with the title Very Reverend Monsignor. On February 20, 1973, Pope Paul VI named Monsignor Imesch, then 41 years old, an Auxiliary Bishop of Detroit and Titular Bishop of Pomaria. He was ordained on April 3, 1973, by John Cardinal Dearden at Sacred Heart Cathedral in Detroit, with Bishops Thomas Gumbleton and Walter Schoenherr serving as co-consecrators. He took as his motto, The Lord is Near. Bishop Imesch served as Regional Bishop of the Northwest Region of Detroit from 1977 until being named Third Bishop of Joliet on June 30, 1979. He was installed by John Cardinal Cody on August 28, 1979, at the Cathedral of St. Raymond Nonnatus in Joliet. Shortly after arriving in Joliet, Bishop Imesch, together with local community leaders, created the Housing Foundation of Will County, and established the Daybreak Shelter to provide emergency services to the homeless. On a monthly basis, throughout the years, the Bishop could be seen at Daybreak, helping to feed the poor and conversing with them. In 1986, the Bishop began the first Diocesan Annual Appeal in order to raise funds to support the efforts of the diocesan agencies and offices. 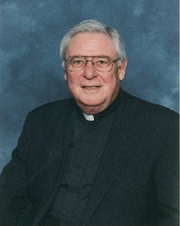 In 1996, he established the Joliet Diocesan Catholic Education Foundation, dedicated to the advancement of Catholic education through providing long-term financial support to families of children who attend Catholic schools. With the support of Bishop Imesch, the Diocesan Peace and Justice Office began its mission outreach program. A sister relationship with the Diocese of Sucre in Bolivia was established and the Bishop oversaw the building and staffing of a hospital there. In addition to his service to the clergy, religious and laity of the diocese, Bishop Imesch served on various local, regional and national boards and on several committees of the United States Conference of Catholic Bishops. Pope Benedict XVI accepted Bishop Imesch’s resignation as Bishop of Joliet on May 16, 2006, and he was named Diocesan Administrator until the installation of Bishop J. Peter Sartain as Fourth Bishop of the Diocese. After his retirement, Bishop Imesch continued to administer the Sacrament of Confirmation, and serve wherever and whenever needed. As his health began to worsen, Bishop Imesch moved to Our Lady of Angels Retirement Home in Joliet, where he died on December 22, 2015, at the age of 84. The Mass of Christian Burial was celebrated on December 29, 2015 at the Cathedral of St. Raymond Nonnatus and interment was at Resurrection Cemetery in Romeoville.